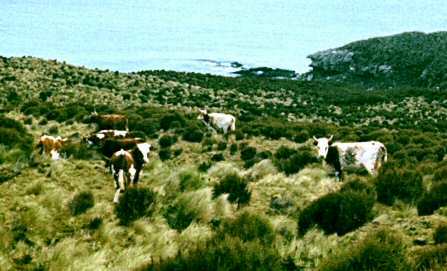 As with other subantarctic islands, livestock were first introduced to Campbell Island, which lies over 600 kilometres south of mainland New Zealand, for the sustenance of any shipwreck survivors who happened to come ashore there. Although there is a report of “an attempt at agriculture which failed in 1856” the veracity of this is in doubt. However, there are reliable records of pigs, guinea fowl and geese being liberated in 1865, and goats and pigs were released there in 1868. Sheep were introduced by a French scientific expedition which stayed there for almost four months at the end of 1874, and although the fate of the other early introductions is unknown, the sheep were seen in subsequent years. The first true farming venture started in 1896 with the importation of between 300 and 400 sheep. In 1901 another 1000 sheep – of Leicester/Merino and Lincoln/Merino crosses – were brought in, and the following year another 1000 sheep plus eight cattle and two horses were landed. In 1903 it was reported that there were then 4000 sheep, two horses, and 20-30 cattle on the island. By 1910 the sheep had increased to nearly 7000, and there were six bulls and ten cows which were allowed to run in a wild state. During the second World War, a coastwatcher noted that there were “about 20 head of cattle” on Campbell Island in 1941, but very little attention was paid to these animals either then or subsequently. In 1954 the island was declared a “reserve for the protection of flora and fauna” and there was increasing pressure to get rid of both the sheep and cattle, particularly because of the effect that they were having on the native vegetation. Studies were made of the sheep and some were taken to the mainland in 1976 (see The Feral Sheep of Campbell Island). The remaining sheep and the cattle appear to have been shot out by the late 1980s or early 1990s, and some accounts give the date of 1984 for the extermination of the cattle. 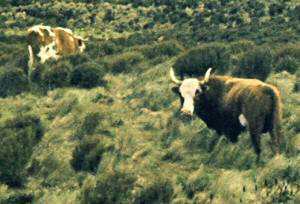 Little is known about the cattle but from photographs taken of them in 1976 it would appear that they probably originated from a largely Shorthorn-type breed. Most of the historical information for this page came from Campbell Island A History by I. S. Kerr, published by A. H. & A. W. Reed, Wellington, in 1976. The photographs are enlarged details from originals held by the Department of Conservation, whose assistance in supplying them is much appreciated.